I think I acquired a very basic familiarity with the main geographical features of Alberta. I know very little about Canada, but this was a good starter kit for the basic layout of Alberta. I'll probably most remember that it borders Montana and there's a city called Medicine Hat. Also I didn't know about the Canamex Highway. 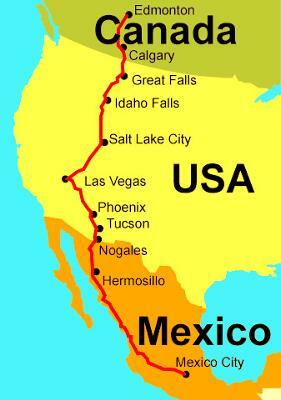 I thought that the biggest North/South highway only went from Mexico to the US, stopping before it reached Canada. Good to know. Barry's Response - Come and visit again sometime. There have been changes. Medicine Hat is my hometown and the Canamex does not run through it. The Canamex was commissioned sometime over the last 10 years or so and is still under construction at certain points. It includes US Interstates 15 (which reaches the Alberta border), 93, 10 and 19 and the Mexico Federal Highway 15. The Alberta routes involved are 2, 3, 4 and 43. Comments for I think I acquired a very basic familiarity with the main geographical features of Alberta. Unfortunately it will be impossible to screen all drivers who wish to travel from Mexico and below to the US and further north to Canada. We must keep the roads safe for all travelers no matter where they travel from. If commercial vehicles are correctly licensed and knowledgeable in the language of the country entering, ad familiar with the driving laws, then it would be a good, working system.